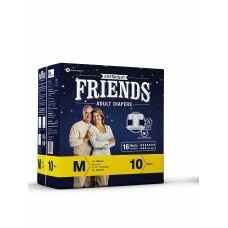 Friends Overnight Adult Diapers give you 16 hours of protection, so that sleep undisturbed. Wake up fresher and get ready to play. It has cloth-like breathable sides which is soft and comfortable on your skin. Waist elastic for better fitment. Wetness indicator to indicate the diaper is full and need to change. 1. 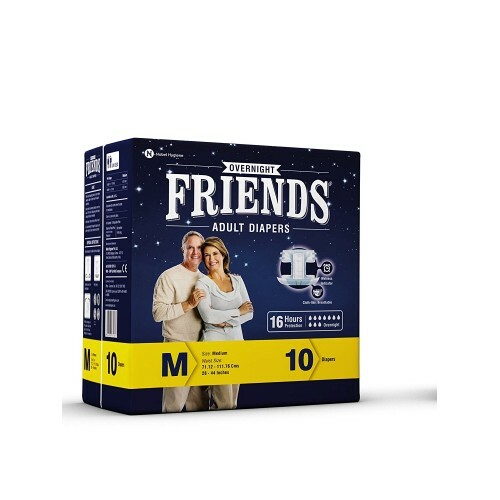 Perfect for overnight sleep as it stays intact for 16 hours. 2. Cloth-like; Breathable Sides: Soft and comfortable on your skin. 3. Wetness Indicator : Marking fades away or changes colour when diaper is wet, indicating the need to change it.